The market for online fraud is growing across the globe, and it continues to become more difficult to spot scams in the first place. Only 9% of UK consumers polled by a Government watchdog were able to answer all of the questions correctly, despite 80% being sure that they would be able to ‘confidently identify a fraudulent approach’. In other words, we overestimate our abilities when it comes to avoiding scams, operating under the mantra that it’ll never happen to us in the first place. Unfortunately, it’s becoming increasingly common, so here are seven ways to stay ahead of fraudsters. People have been getting scammed since the dawn of time. From letters in the mail to fake cheques, there have always been some who aim to make a quick buck at your expense. 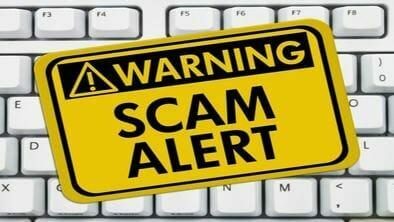 Online scams are simply the modern equivalent of grifting, with the main difference being that the scammer can attack from anywhere in the world. This is a major issue, as your local police force is unlikely to have jurisdiction in areas like West Africa and Eastern Europe. The days of ‘Nigerian Prince’ scams may have come and gone, but that just means that the methods used have continued to evolve, and many have it down to an artform. From Instagram to Facebook, impersonation and catfishing are also a real problem, and that’s before we get to dating websites. Research has shown that the average victim of dating fraud paid out £10,000, and the number of users affected continues to grow each year. Here are seven ways to spot online scams, and how to stay safe in the future. Scammers will go to great lengths to pretend that they’re representing a company like PayPal or Apple, or even your personal bank. Generally, they’ll use email in an attempt to compromise your account, asking you to sign in via a dodgy link. For example, clicking the blue link in the image shown above will likely link to a page aiming to harvest your information, with a keylogger recording everything you type. It means that you could have issues even if you realize your mistake halfway through, so you have to be especially careful. Phishing email accounts is one of the most common methods used to steal personal information. You should always be careful when replying to unsolicited emails, and it’s always best to sign in to a website directly if you’re worried. #2: Consider; Is it too Good to be True? Most scams are simply too good to be true. They might offer an item at an unbelievably low price, or there could be a job that pays an incredible wage compared to the average. 99% of the time it’s likely there’s a catch, and they’re probably aiming to get hold of personal information such as your banking details or the money itself. Research is key when it comes to avoiding scams like these. You should spend time checking out the seller, or finding out whether their business exists in the first place. Reverse searching profile pictures via Google Image Search is possibly the easiest way to see if a person is real, although it won’t work every time. #3: What are They Trying to Get From You? Many different types of personal information are valuable on the black market. Any job that asks for a photo is highly suspicious, while you should always be wary if you’re asked to send across photographic ID. Straightforward scams that aim to extract money are often easy to spot, but they don’t need much information to cause damage. Jeremy Clarkson of Top Gear fame posted his account numbers in a national newspaper column in an attempt to prove it was a fuss over nothing back in 2008, and promptly learned his lesson after finding out that a reader had managed to set up a £500 direct debit in his name. As a rule of thumb, never give out personal information such as passwords or account information, and spend a moment or two to try to understand the intentions of the person you’re speaking to. Remote access will give a scammer full control over your computer, where they can do all sorts of damage from anywhere in the world. This is commonly achieved by offering to remove malware and viruses, and there’s nothing you can do once they’ve taken control. It’s so prevalent that there’s a Twitch channel dedicated to catching people out, using a virtual machine to give the scammer access to a dummy desktop. If you’ve seen a couple you’ll know what to look out for, but the TL:DW version is; never allow anyone access to your computer remotely. It should go without saying; never hand out your personal login information, no matter what. If you use the same password regularly you could be handing over the keys to your entire online presence, forcing you to watch helplessly as everything is burned to the ground. After combing through your files you could be subject to anything from blackmail to identity theft, so change your password immediately if you suspect anything. Regularly updating your system software is good practice if you want the latest patches to protect you from exploits and malware. Software is generally more susceptible if it isn’t up to date, so try to do so periodically. A solid firewall can often be a pain if you’re used to downloading torrents and other files from the internet, but the option is there for a reason. Decent firewall software will be able to detect and block the majority of known threats, so make use of it when you can. Anything from dating apps to Facebook can potentially compromise your identity if you offer too much personal information in your profile. It’s best to be careful when posting something to a social media account, and privacy settings should also be looked at carefully. Make sure to keep access restricted to people you know in real life. A Virtual Private Network (VPN) is a smart way to add another layer of security while online. It masks your IP address, with most allowing you to download torrents on high-speed servers without exposing your location. Allow you to use public Wi-Fi safely – A VPN will mask your connection while you’re using public Wi-Fi. Avoid malware – A number of providers have inbuilt malware detection software. Provide online privacy – Discretion is the better part of valor, so you’ll be able to avoid a lot of problems thanks to the additional privacy provided by a VPN. It’s easy to think that it’ll never happen to you, but more people than ever are falling victim to online fraud. Of course, being scammed is terrible. Not only in terms of the financial loss, but also because of the emotional distress that goes with it. A VPN will guard you against a decent number of scams, but it’s also important to keep your wits about you while you’re online. For the fraudsters, it’s big business, and it’s likely to continue to grow in the coming decade.